The MCEM91T, trailable point machine, installed at the track side, provides the electrical drive of the switch. This point machine allows its locking and its detection in end positions. Trailable version of the MCEM91, it includes a trailing disc that enables switch trailing, while protecting the point machine. The MCEM91T is used for conventional lines such as railway depots and for urban transport such as metro. 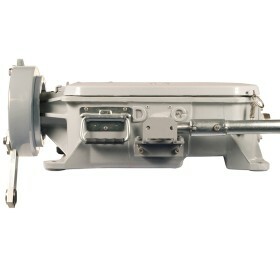 With the MCEM91T point machine, a rod provides the drive function. This driving rod can also be easily integrated into a bearer, thus permitting the mechanised tamping of the turnout. One pair of Paulvé detectors at the switch toe can detect the trailing by comparing the position of the switch with the position of the drive. The mechanism is also equipped with a trailing detection device.